Hello Save Old Town School Community! Over the past four weeks, our community has expressed dismay and anger about the sudden announcement. We were further saddened to hear about the "voluntary separation" agreements sent last week to School staff members, and continue to not feel heard by the decision-makers at OTS. However, we have been incredibly inspired by the continued messages of passionate support for our beloved institution. There are lots of ways you can help -- starting, this week, with a letter-writing campaign to members of the School's board of Directors. 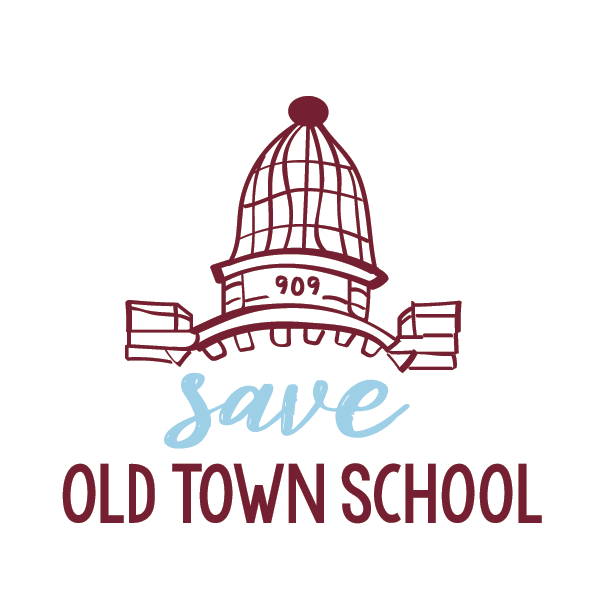 Read on to learn more about what you can do to Save Old Town School. P.S. Keep an eye out for our announcements about a #WhatOTSMeans video campaign and also a Save Old Town School Community Forum! Action Item - Letters to the Board! In the past four weeks, many of you have expressed dismay and anger about the sudden announcement of the plan to sell the historic 909 W. Armitage building. Here’s an important way you can help right now. 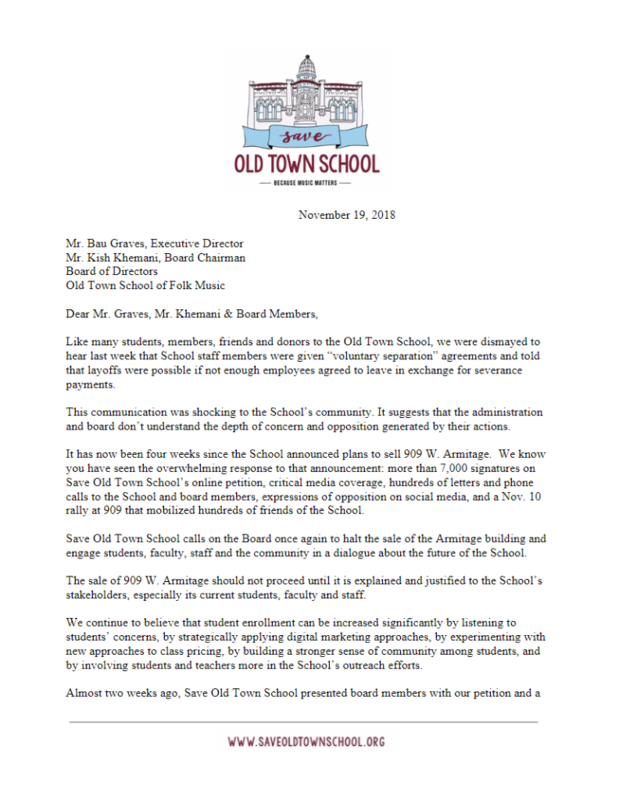 The directors of the Old Town School board are the ones that truly hold the future of the Armitage building— and of the entire school — in their hands. We want to ensure that each of the board members has an opportunity to hear every voice of the community on this issue. We want YOU to send us a copy of your letters so we can compile them and make SURE they get in front of the people who need to see them! 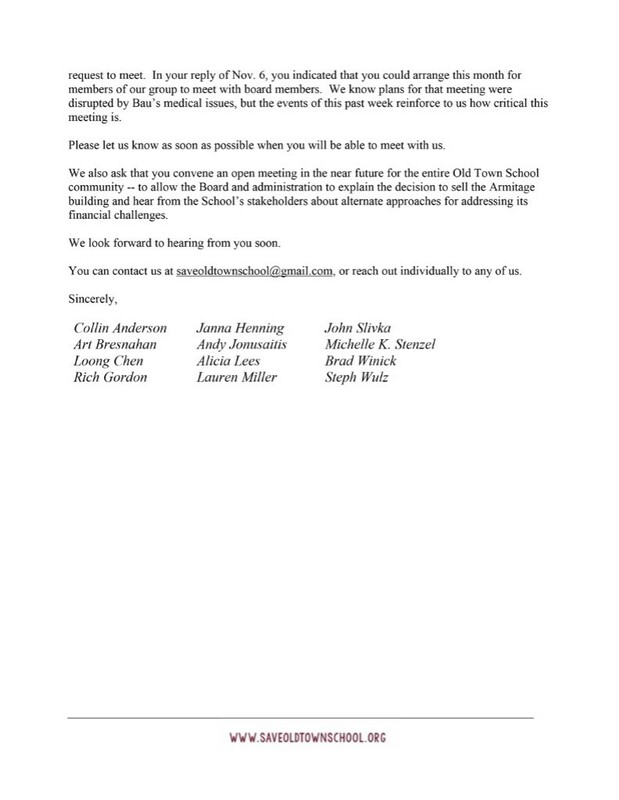 If you haven’t already sent a letter to the Board, now is the time to! Follow the link for a template and ideas on what to say! We're not sure the Board of Directors really understands why OTS is so special, so we want to make sure they get a chance to hear our stories! Next week we will be launching a video campaign full of your #whatotsmeans testimonials. WE NEED YOUR HELP! If you have some time to spare, our Community Outreach team will guide you on specific tasks. Some items we currently need help with are listed below, but let us know if there's something else you'd rather do. PLEASE LET US KNOW IF YOU HAVE ANY CONNECTIONS! For all news stories, visit our site.